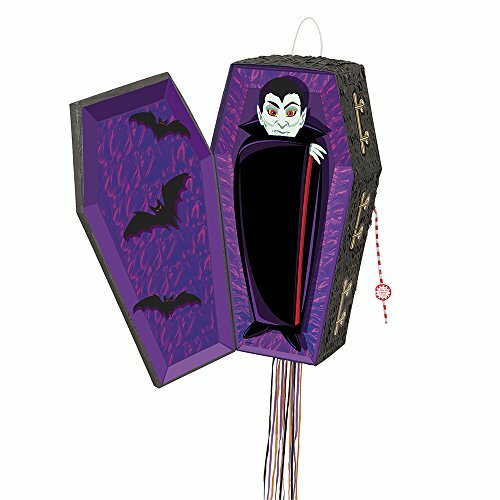 Garlic won’t be necessary to have a good time with this Vampire Coffin Pinata. As scary as he looks, this classic party game is sure to bring nothing but smiles at a Halloween party or costume party. In a new twist on the classic game, guests take turns pulling one of the 12 attached pull strings at the bottom to find the one that opens the trap door and releases all the candy and party favors. This pinata ships flat, but has two attached cords that once pulled will pop the pinata back into its 3D shape shown. Pinatas can hold up to 2 pounds of candy and party favors.